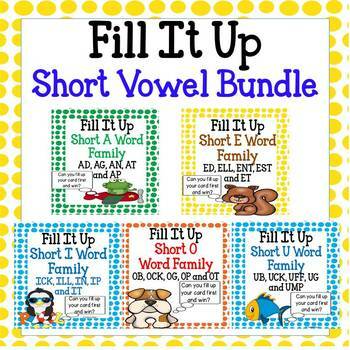 Short Vowel Word Family Bundle - Fill it Up! Buy the Bundle and get 1 game free!! This set contains 5 fun, interactive games where students add onset letters to rimes to make short vowel words. More than 50 words can be made per set for a total of more than 250 words. In Short A Fill it Up each student has a lily pad card with the rimes AD, AG, AN, AT and AP. The students then draw frog onset word cards to try and make a new word. In Short I Fill it Up each student has an iceberg card with the rimes ICK, ILL, IN, IP and IT. The students then draw penguin onset word cards to try and make a new word. 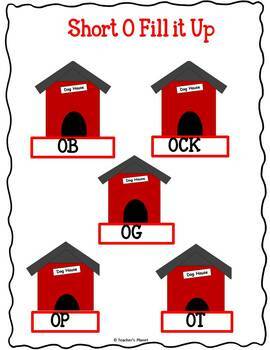 In Short O Fill it Up each student has a dog house card with the rimes OB, OCK, OG, OP and OT. 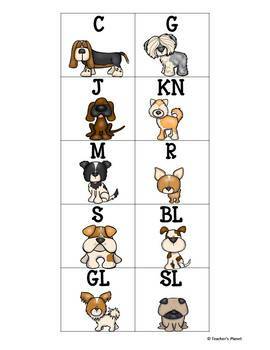 The students then draw dog onset word cards to try and make a new word. In Short U Fill it Up each student has an ocean card with the rimes UB, UCK, UFF, UG and UMP. The students then draw sea creature onset word cards to try and make a new word. 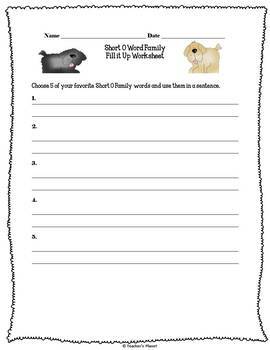 Also included are answer keys and worksheets to further practice word families. This game can be played in centers, small groups or large groups. This interactive game develops an understanding of word families, spelling patterns and phonics patterns while improving reading fluency. FREE Reading Strategies Dice Detective!